This is one of the best hostels I have ever seen. It’s clean and stylish and well thought out. 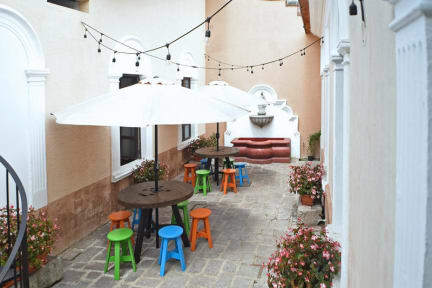 All the little details, as well as it’s fabulous location and friendly staff add up to a stellar hostel. I had tripped and fell while hiking and fractured my leg and they were very accommodating to put me on a bottom bunk. Super helpful staff and such a lovely space, beautiful kitchen, and great breakfast. It was really nice and quiet but near Cafe No Se and close to the square. Highly recommend and would stay again! A very clean hostel in a great location. Friendly and helpful staff. The breakfast is included and much better than most hostels. Highly recommended! Only positive things to say about my experience at Cucuruchos! The staff was extremely friendly, helpful and accommodating with everything! The rooms were very clean, and the bed comfortable. A must for experiencing Antigua and a gateway to the hidden Mayan gem that is Guatemala. This hostel is so lovely. Clean, cute, warm, and quiet at night. 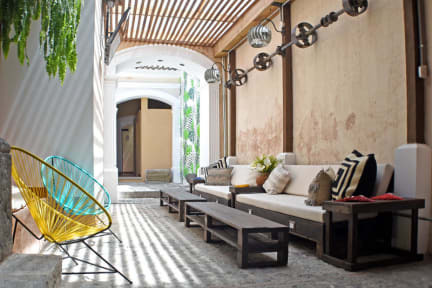 Great location, although everything is within walking distance in Antigua. The staff was wonderful. We arrived at 7 am after traveling all night, and the lady that checked us in let us take a shower, & store our stuff until we could check in at 2. My boyfriend and I got engaged on that trip, and the staff wrote us a sweet note and gave us some sweets to celebrate. Thank you Cucuruchos! We will visit again! Everything was just great here! Loved the breakfast, nice decor, great location close to everything, helpful and welcoming staff! The hostel is really lovely. A fantastic location. Very clean with really comfy and well set out beds. It’s not a good place to meet people but if you need somewhere to relax it’s almost perfect. I have stayed at Cucuruchos Boutique Hostel twice now and both times have been lovely! The hostel is gorgeous, close to Parque Central, extremely clean, and comfortable. I would recommend this hostel to everyone traveling to Antigua. We had such a lovely stay at this hostel - highlights include free cake at 5, tea and coffee on tap, excellent breakfast and thorough maid service. These were only some of the things that made our stay so lovely. Unfortunately, the only downside wasthe incessant music that started at 9 and ended at 11 which at times felt like a cheap way of creating atmosphere, when with such a lovely hostel silence would have complimented the place far more. Thank you for a great stay otherwise!